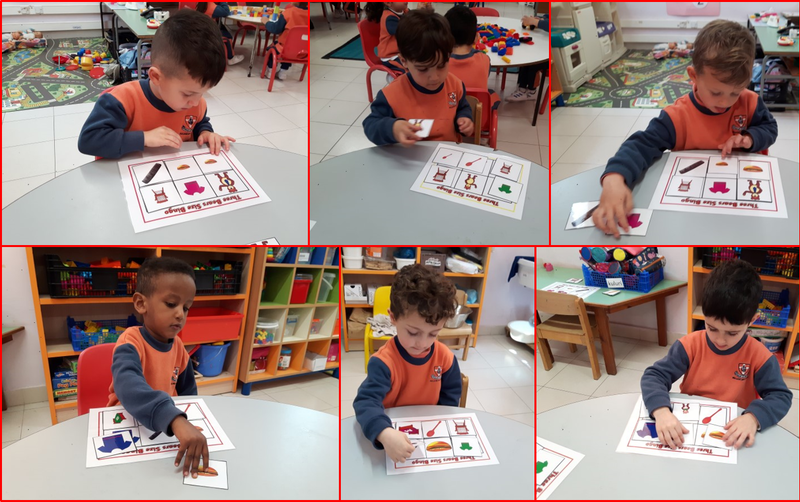 Using the theme Goldilocks and the Three Bears, kinder incorporated a sorting game of small, medium and large, and two activities on the interactive white board, namely, sorting colours and value of numbers. 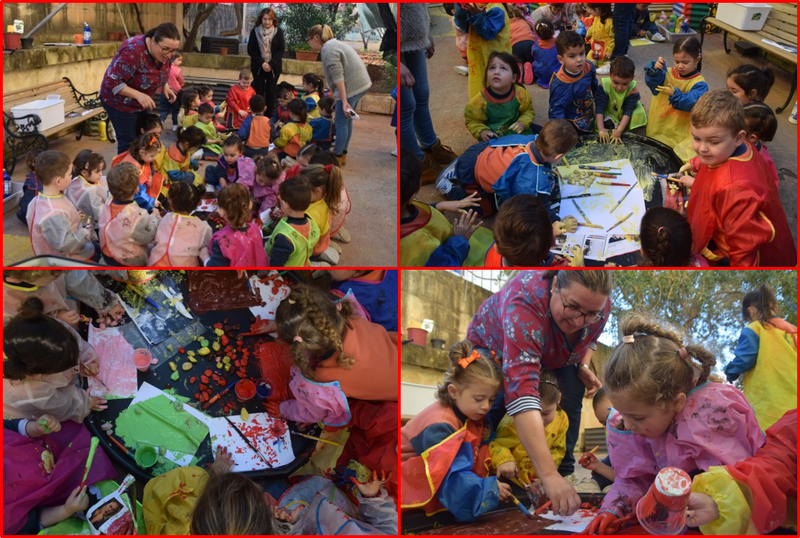 The activity finished off by colouring masks of Goldilocks and the Three Bears. 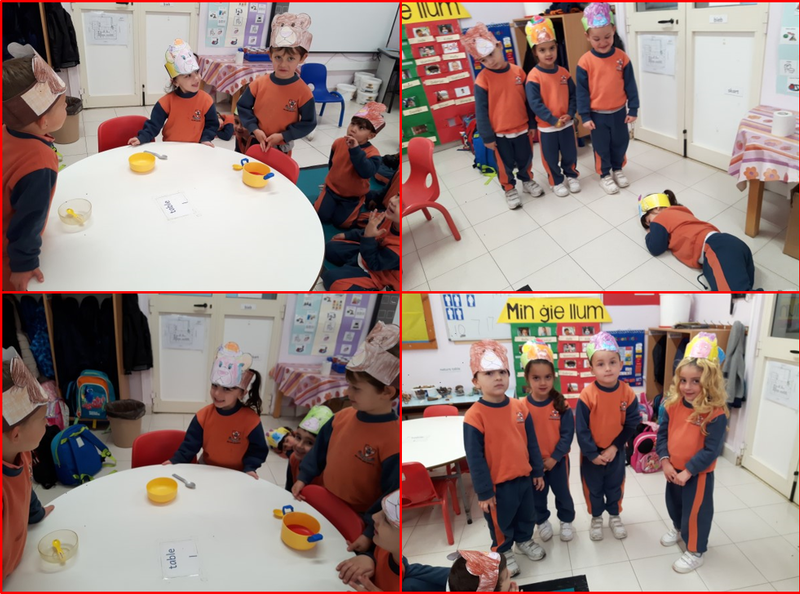 This entry was posted in Kinder and tagged literacy day on 14 April, 2019 by mgarrprimary. 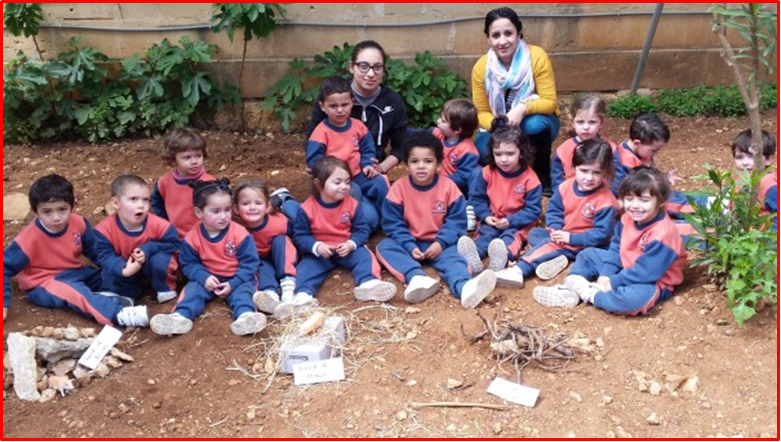 The children went outside in the school garden to pick up straws, sticks and bricks to build up the pig’s houses. The children worked together as a team. They really enjoyed it. 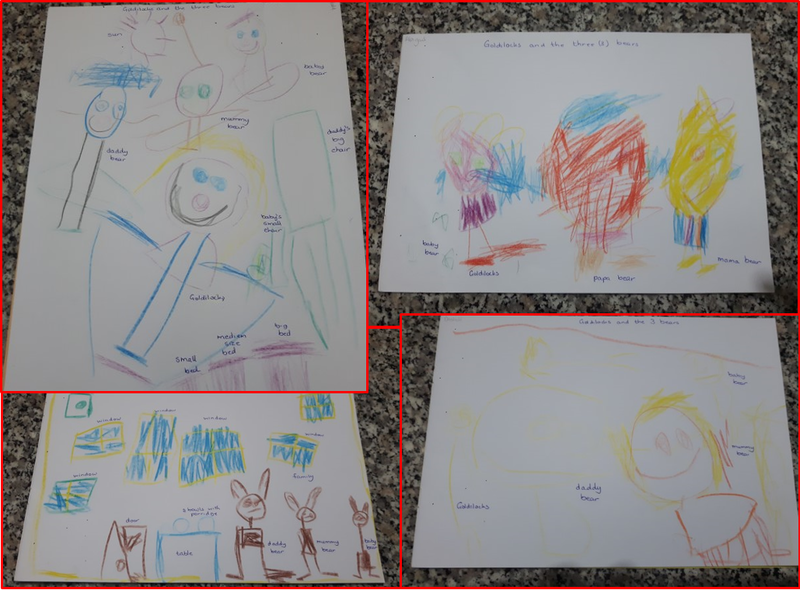 This entry was posted in Kinder and tagged literacy day on 12 April, 2019 by mgarrprimary. 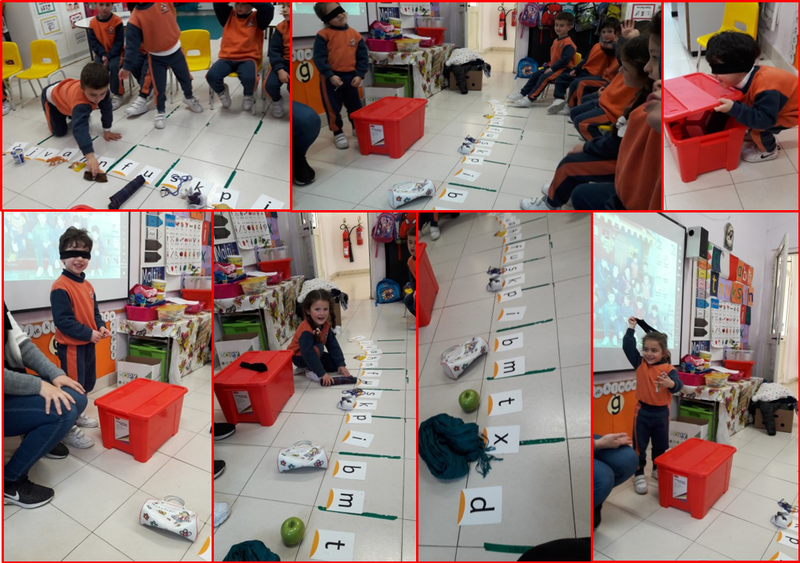 Children tried to guess the object they picked from the box, blind folded. 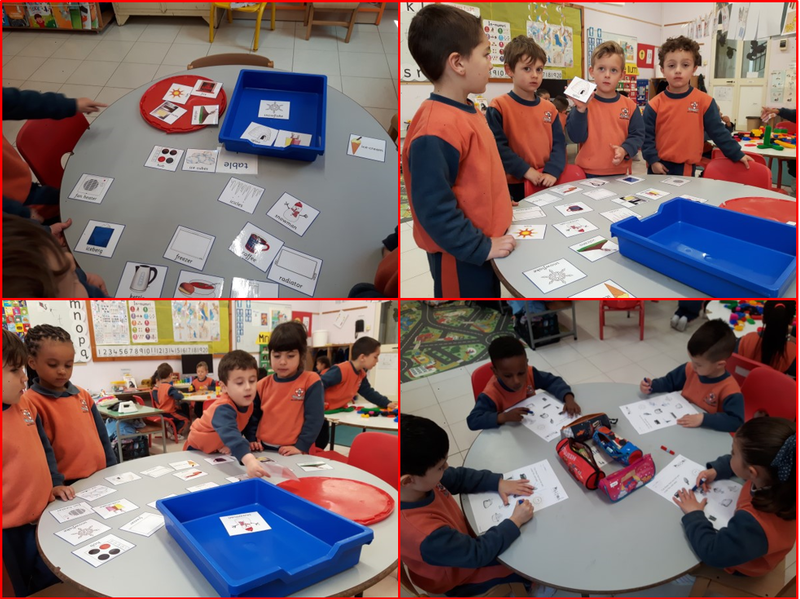 Then they had to put the object on the right letter.Then we tried to build up a story with the objects used in the game or describing the object chosen. K1.3 started the day by going through the story using puppets. 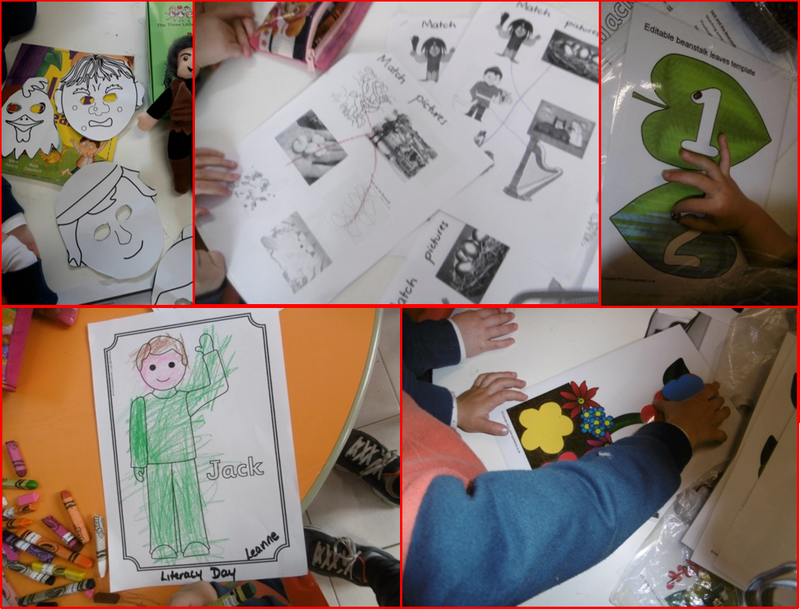 Then children created a mask using different characters of the story. 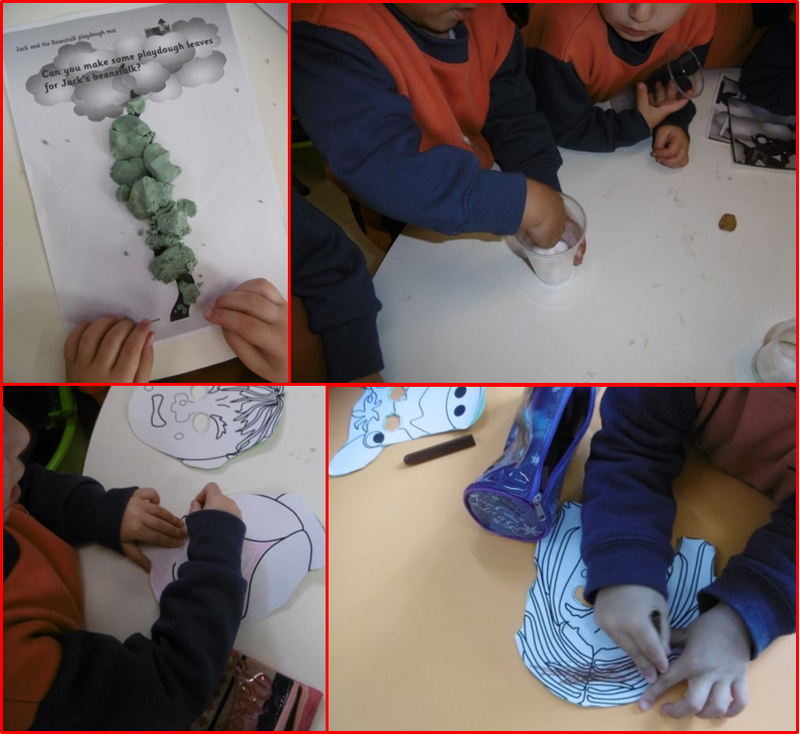 Going through the process of a planted bean, the children were given some cotton wool to sow a bean in a cup (the beanstalk). They were also given some playdough mats to create their own beans, coins, beanstalk and eggs. 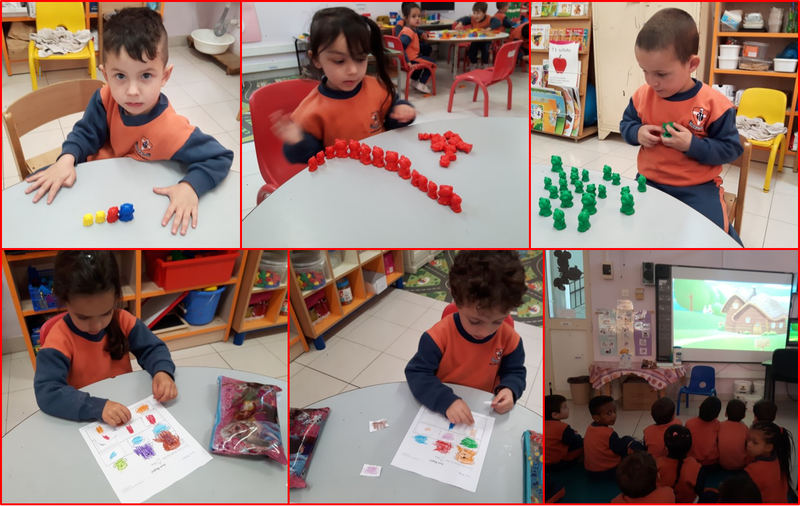 Numeracy (counting beans) was integrated with the learning experience. A leaf template was presented where children could count the beans according to the number shown. Flower flashcards were given to create them on the mats followed by colouring to add on. The last activity included matching pictures. 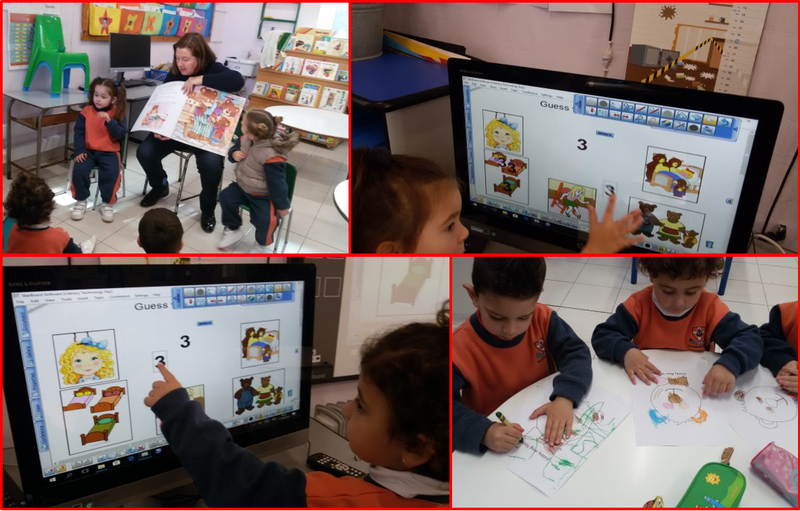 This entry was posted in Kinder and tagged literacy day on 11 April, 2019 by mgarrprimary. 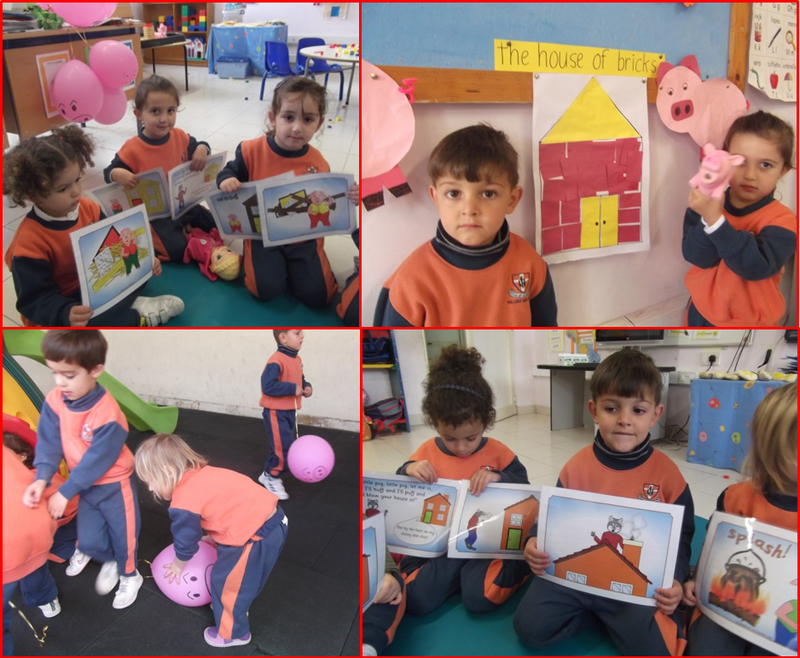 With the help of the story “The three little pigs”. Story and song – story sequence and flashcards. 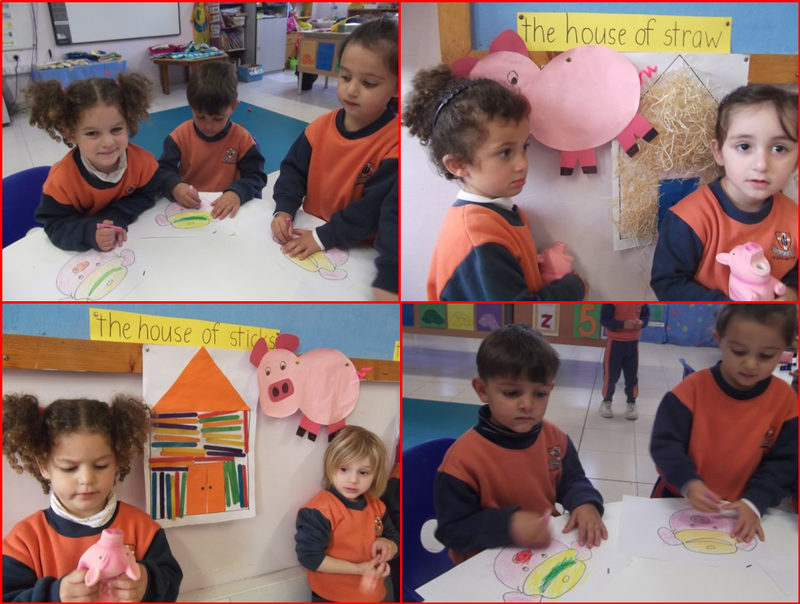 Related activities: Numeracy: house measuring, counting of 3 pigs, 3 houses,3 hats etc. Science: air can move things. The wolf blows the houses down. Hot or cold water. Sensory trays: twigs, straws, lego bricks, leaves and plastic pigs. 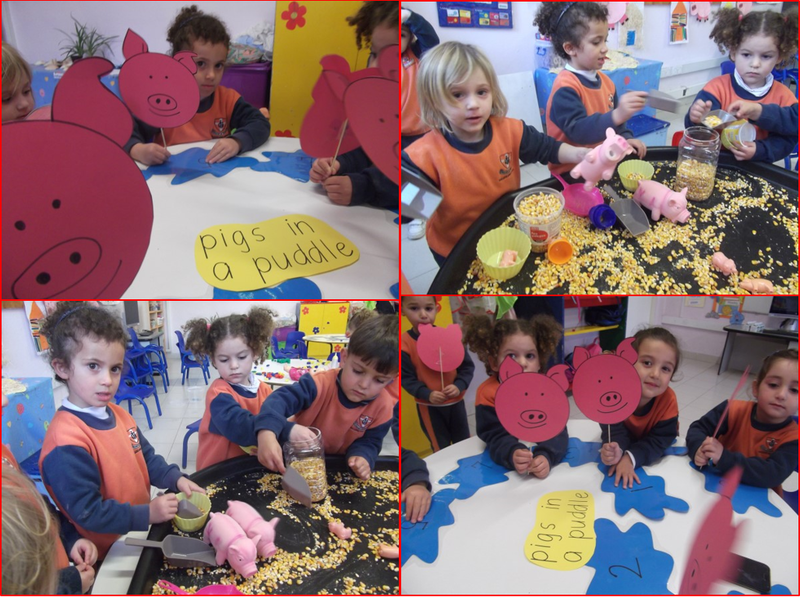 Crafts: pigs and wolf mask, building house craft, stick puppets, pig balloons. 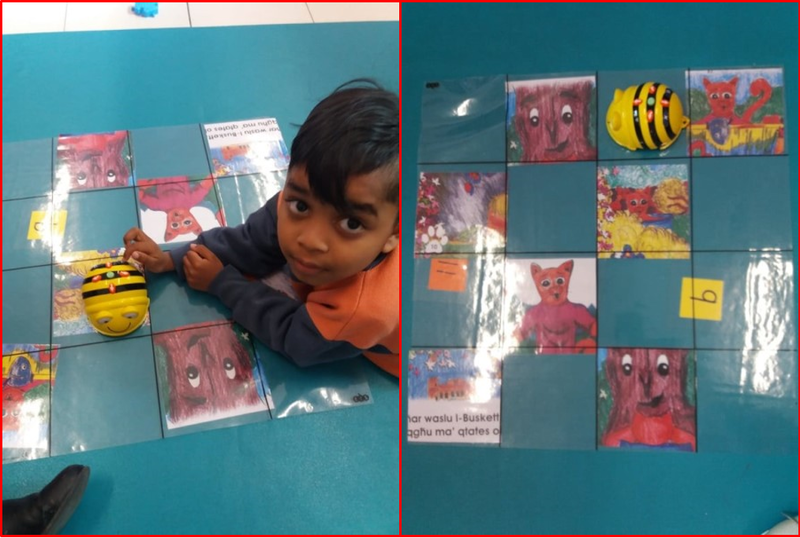 Story sack resource pack to support teaching the story – this includes visuals, animal flashcards, animal finger puppets, sequencing cards, colouring in sheets and matching games. Playdough mats related to the story. Different rhymes and songs related to jungle animals like Walking in the jungle; Circle of life; I just can’t wait to be king. 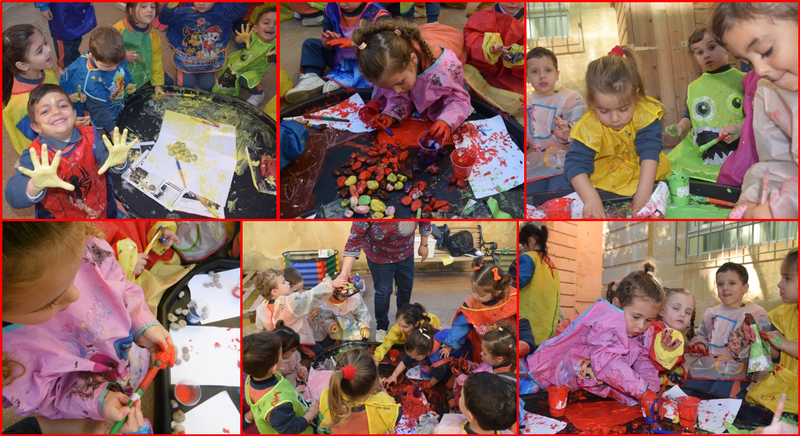 Messy Play: Jungle Animals sensory bin. Gross motor skills: Throw the dice and move like the animal. 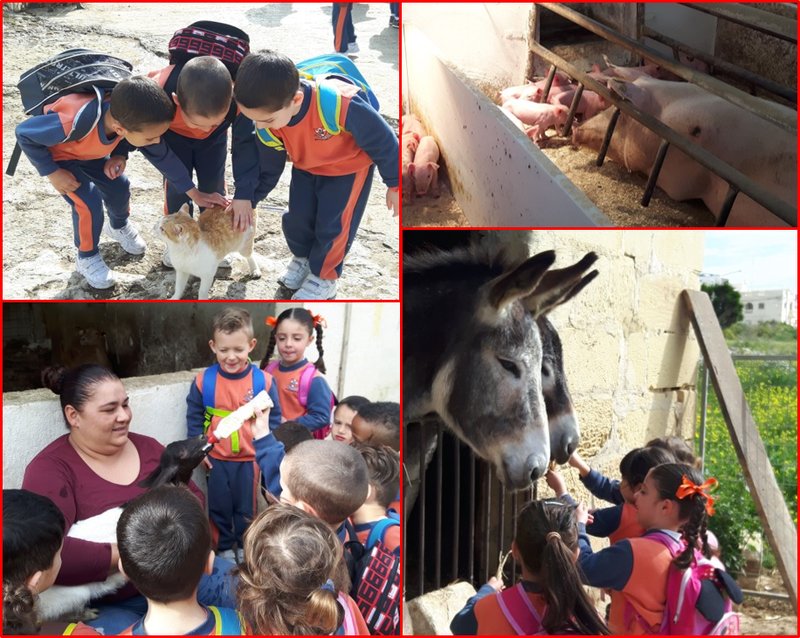 K2.3 visited two farms within walking distance from school. Although some children complained about the walk they enjoyed it. They were overwhelmed with this experience. 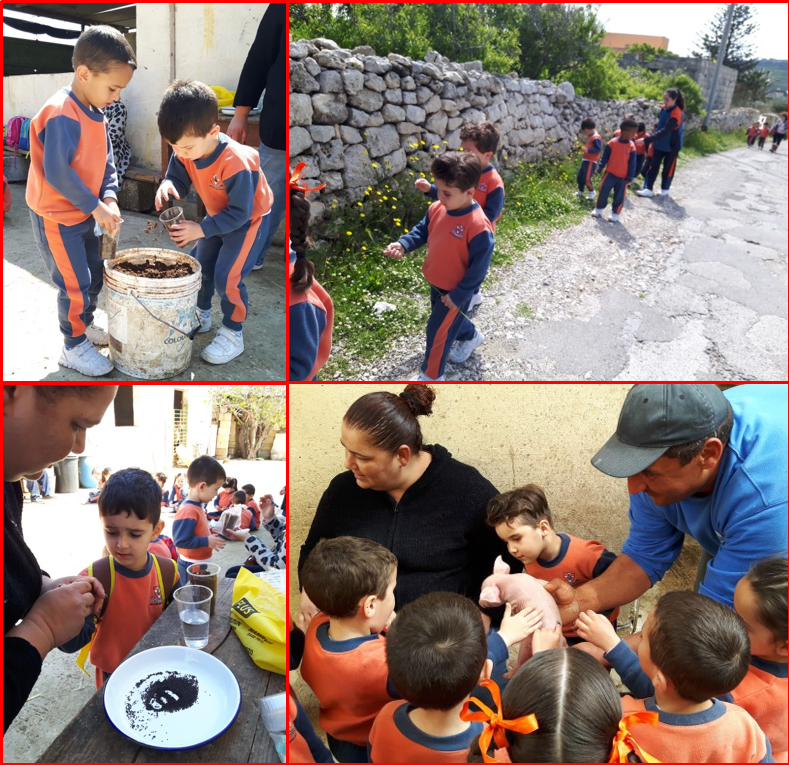 They were able to hold, pet, feed and bottle feed the animals and sow some basil seeds. The students really enjoyed this experience. Below is a short video clip for you to enjoy. 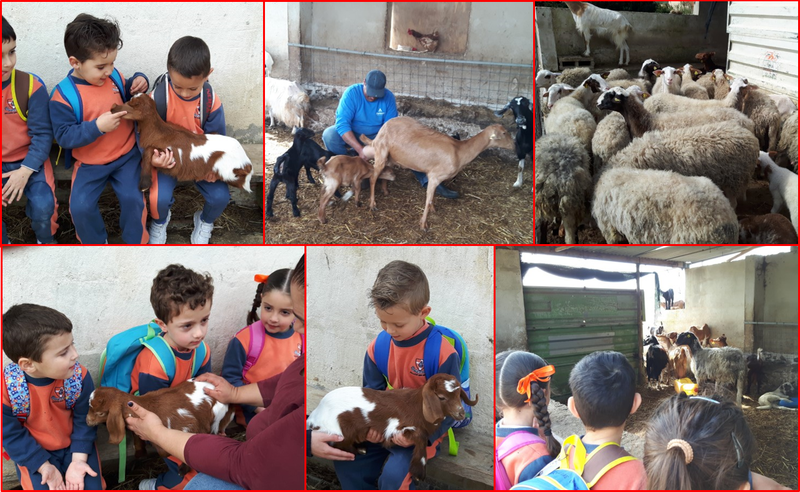 This entry was posted in Kinder and tagged farm on 10 April, 2019 by mgarrprimary. 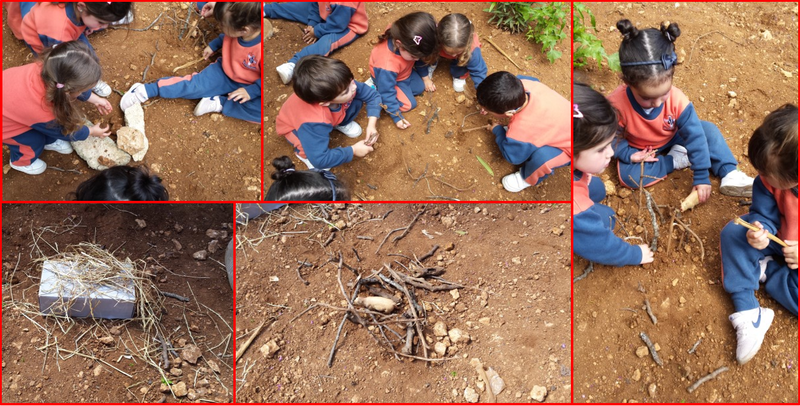 The kindergarten students enjoyed an outdoor activities creating patterns, shapes and horizontal lines using pebbles and paint. 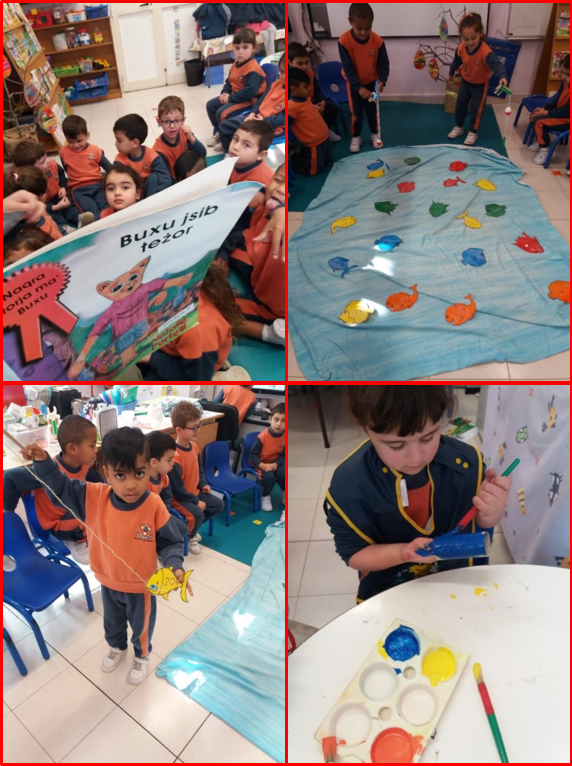 This entry was posted in Kinder and tagged erasmus, paint, patterns, pebbles, TIP on 3 April, 2019 by mgarrprimary.